Correctly aligned tires will reduce tire wear, and ensure that your vehicle travels straight and true (without "pulling" to one side). 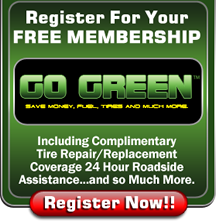 Your tires should be checked during routine maintenance, but if you notice uneven tire wear or your car is pulling to one side, you should have a qualified automotive technician examine your car. You can trust the technicians at McGhees Auto Service to thoroughly examine your vehicle's tires and correct the alignment if necessary. Call us at 301-843-6551 if you have any questions or want to schedule an appointment. Wheel alignment (or simply alignment) is standard car maintenance that involves adjusting the angles of the wheels so that they are set to the manufacturer's specifications. The main purpose is to let the suspension and the steering systems operate at their desired angles - this reduces tire wear. Alignment is a complicated process and not all mechanics get it right. To have experts handle your car's alignment, visit McGhees Auto Service.